The creation of this Reiki goddess was a rewarding experience from the very beginning. 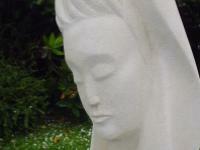 My client wanted a calm and peaceful stone carving as a feature of her Reiki business. It is a feature that greets her clients as they come for a Reiki treatment. When I first met her and her husband, I could sense that she is passionate about her business and is a caring and warm person committed to the healing of others. 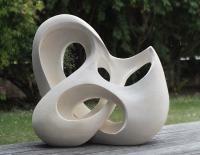 After a brief meeting over a cup of tea and cake I was shown where she would like the sculpture to be. I took some measurements and left to develop some ideas and suggestions that would be fitting for her Reiki business. I understand that Reiki is an alternative medical technique where healing energy flows from the therapist to the patient through the placement of hands. So in my design process, I focused on visualising a woman in meditation with the idea of her healing hands generating energy within. I then used a computer imaging program to add my drawing to a background photo of the site so they could see exactly how the Reiki goddess would look. In many ways this is an most important part of the relationship with my clients. I can clearly show them a good view of the design with a clear idea of height and width and how it will fit into the environment it is meant for. 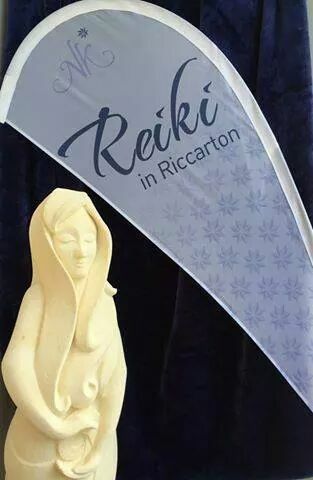 When I presented my client and her husband with the image of the Reiki Goddess they loved it. They were very impressed with how professional it looked and the client commented somehow I had read her mind. (She now calls me a soul artist.) I too also personally loved the design concept myself and I was really excited about sculpting it. I feel that as an artist it is great to be able to design and create an artwork that no one has ever seen before, It is totally exhilarating, and I appreciate the trust that my client placed in me. Like all of my other projects. I kept my clients well informed throughout the stone carving process from the time the stone was delivered to the drawing on the stone that is scaled up, through to the sculpture being shaped out. But sometimes things happen that can't be helped. Within this job I had a delay of a few weeks for the stone block to arrive at the depot. Then another week for it to get delivered to my residence. It is very important to keep the customers informed of what is happening. 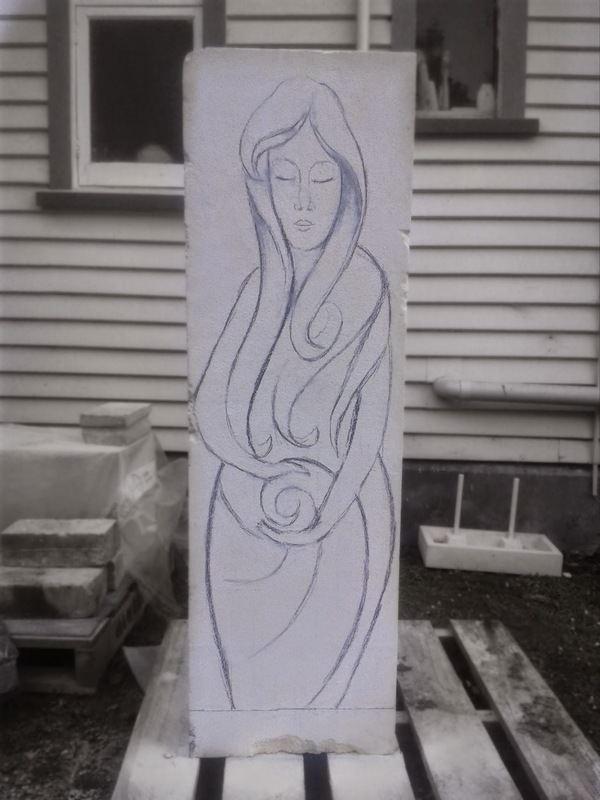 Once the stone did arrive, I got straight into drawing the enlarged design of the Reiki Goddess onto the stone. Once I was happy with the sketch I sent the image to my client. Again, it's all about keeping the customer up to date with what's going on. 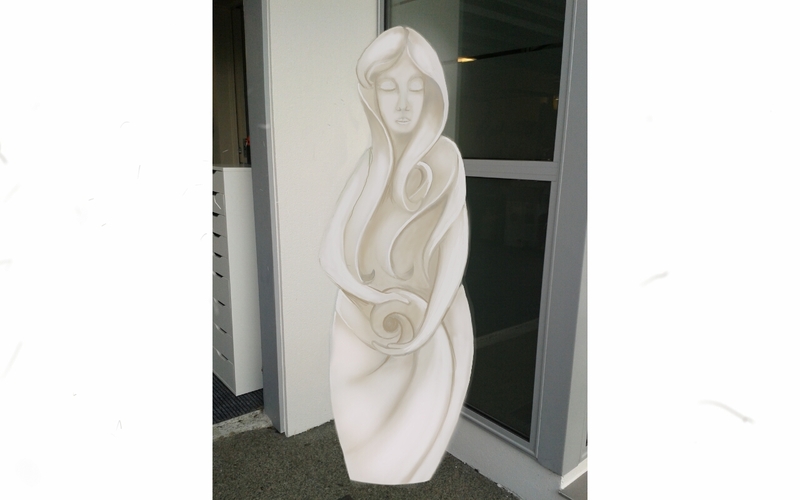 It is important to know that if you are keen to make a large sculpture yourself, that your design on paper dictates what the stone size will be when you order it. In other words you will have to scale up to make sure that the stone block is not too short or the width is not too narrow. You also have to consider the depth of the block as well. There is no point is having a design sketch and then trying to make it fit with a random sized stone block. This part is really all about the getting right down to it and starting the sawing, chiselling and shaping. It is a time of trust. The trust that the client has in you, and the trust that you have in yourself as a artist to get it right. Sometimes artists fall into the trap of working on one style say abstract but then taking on a job the requires that the sculpture is anatomically correct. Its all about having some experience first. It is not until most of the shaping is done that you send an image to your client to show your progress. Then you can continue filing and sanding until it is ready for delivery. 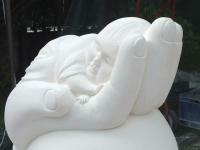 When this sculpture was delivered to my client, She loved it and has used it in this promotional ad. I am thrilled that it is a feature image for her business and I wish her all success with it.